Molecular modeling, the modeling of molecular interactions, has become established over the past decades as a standard method in the development of pharmaceuticals. At the Institute for Nutritional Sciences of the University of Potsdam, molecular modeling methods are used in interdisciplinary research to assess the behavior of nutritionally relevant compounds at molecular level. Characterizing such interactions, in addition to functional data from established biochemical and physiological testing procedures, contributes significantly to a better understanding of the importance of individual food components for preventing diet-related conditions, such as cardiovascular disease, cancer, diabetes mellitus and neurodegenerative diseases. The research strategy is therefore to focus on evaluating biomarkers for the health-promoting or harmful effects of such dietary constituents. The first approach is identifying and characterizing proteins by using standard proteomics technologies that allow so-called protein profiling or mapping. The second approach is to evaluate any changes that certain food ingredients cause to the structure of proteins and thus their functions, for which the term “functional proteomics" is used. Dietary constituents interacting with certain proteins can not only modify the structure of that protein, causing microheterogeneity, but also bring about changes in the interaction between proteins. Changes in the proteome can be used as biomarkers or surrogate endpoints for the health benefits of individual dietary ingredients as well as for the severity of a disease. 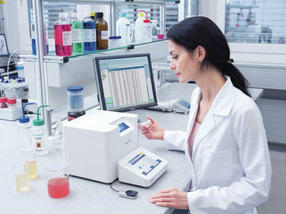 Furthermore, identified molecular structures can serve as targets for nutritive compounds. Biomarker and target structures are typically conferred by peptides or proteins. Besides the effect of individual food components on the expression of proteins, the interaction of dietary ingredients with the proteome itself is particularly important. The interactions of food constituents with certain proteins can lead to modifications of tertiary protein structures. As a result of such conformational changes, the activity of an enzyme, for example, or the ability of macromolecules (protein/protein) and small molecules (protein receptor/ligand) to interact can change. Bioactive food ingredients have the potential to effectuate both covalent and noncovalent modifications. Such altered molecules can also serve as potential nutritional targets to which, like target molecules for drugs in blood or body cells, bioactive agents bind specifically, thereby triggering effects. In addition, many proteins fulfill their proper function only in combination with other biomolecules as ligands. Such molecules can be other proteins (“protein-protein interactions”) or metabolites (“small molecule protein interactions”), both examples of “interactomics” in a wider sense. A significant difference to pharmaceutical research is that changes to dietary constituents (proteins) are investigated outside the body, due to food technology processes. © Homann, T., Rawel, H.M., Schweigert, F.J., Kleuser, B. Fig. 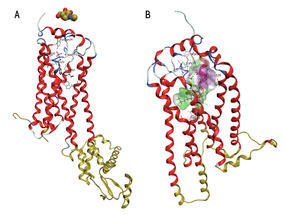 1 Illustration of possible sites for protein modifications in coffee storage protein, adapted from . The aim of molecular modeling research is based on the conceptual and experimental analytics approach of characterizing the interaction of dietary constituents and metabolites with various proteins. Common methods of molecular modeling include docking (ligand to target, protein/protein), molecular dynamics studies and homology modeling of proteins. Some examples from our research will illustrate these methods. Coffee is the name given to the seeds of the genus Coffea that have been freed of their pericarp and episperm. Storage proteins make up the largest proportion of the total protein content in seeds. The main fraction is a globular 11S protein, a hexamer. Under reducing conditions, each of its six subunits of about 58 kDa can be split into an α and a β subunit. Coffee beans are among the foods that contain the highest amount of chlorogenic acid. One property of such phenolic substances is their susceptibility to oxidation, allowing post-harvest reactions with coffee proteins to occur. During processing and storage, phenolic components of plant foods may react with the amino acids of food proteins. Such reactions can alter the physicochemical properties of proteins as well as their nutritional value. Proteins contain a variety of reactive side groups (e.g. thiol, hydroxyl, amino groups) that can undergo covalent and non-covalent interactions with phenolic compounds. Fig. 2 T3 ejection from TTR. The molecular surface around the exit channel is shown. It is possible to see that the region changes from lipophilic (green) to hydrophilic (gold). Neutral or less pronounced properties are shown in white or in lighter color. For further details, see . Our results demonstrate extensive and very heterogeneous adduct formation with the amino side chains of lysine and cysteine. A catalog of the various reaction products was created and the possibilities for such reactions localized and modeled in green coffee beans. 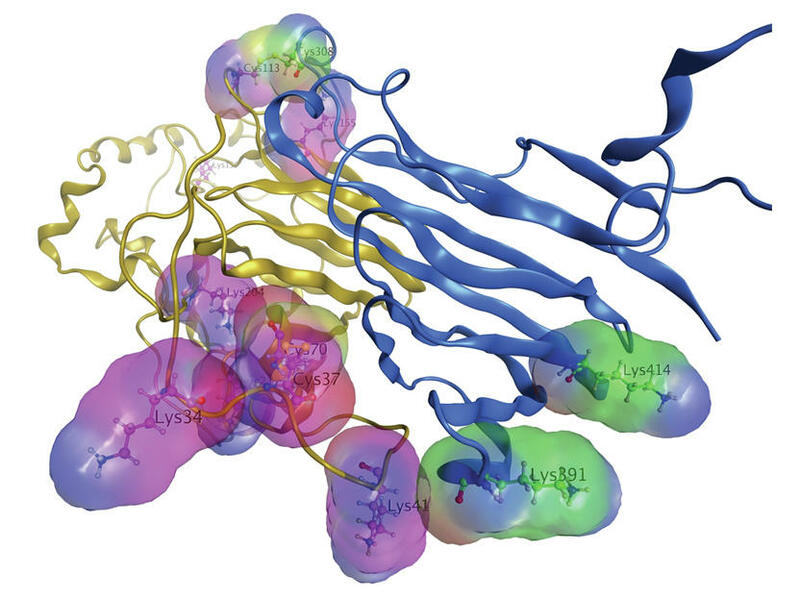 To do so, the coffee protein was first modeled (homology model starting with PDB templates: 3FZ3-BD, 2D5F-B and 3C3V-A (monomers) as well as 3KSC, 2E9Q and 1UD1 (trimers); database entry protein database pdb - http://www.pdb.org/pdb/home/home.do), the “pharmacophore” on the reactive amino side chains defined as an auxiliary function and the reaction or modification of the coffee protein simulated by docking studies. The details of the approaches are described in . Figure 1 shows possible protein modifications in the coffee protein. Transthyretin (TTR) is a transport protein for thyroid hormones (T3, T4) and retinol (in a complex with RBP4), is highly conserved throughout evolution and found in the blood and the cerebrospinal fluid of humans . It is a homotetramer with each subunit consisting of 127 amino acids and containing a high proportion of β-sheet structures . A large number of X-ray structures have become known for TTR. So far, standard methods of molecular modeling have been used in most cases (docking, homology modeling, protein design). To study the influence of posttranslational protein modification (PTM) on the transport of thyroid hormones by TTR, the steered molecular dynamics (SMD) method was used. This approach provides a means of studying the dynamics between bonding and dissociation of a biomolecular system as well as, in our case, investigating the rate of T3/T4 ejection and its interactions with differently modified TTRs. This method allowed us to demonstrate that the PTMs have a significant influence on the ejection speed of the thyroid hormone from its binding position. This is a consequence of the protein interacting with the changing ligands and also of modifications occurring at the exit channel, which can be so significant that it closes. These processes can be related to hypothyroidism and hyperthyroidism. Figure 2 shows the path of the T3 from TTR. The sphingosine-1-phosphate receptors (subtypes S1P1 to S1P5) are membrane-bound G protein-coupled receptors regarded as class A (rhodopsin-like). The native ligand of these receptors is sphingosine-1-phosphate (S1P). The S1P receptors are regulated by S1P and are therefore subject to autocrine and paracrine regulation with intracellular and extracellular effects. S1P mediates numerous physiological effects in the body and is also involved in pathophysiological changes. S1P possesses a particular significance for immunological processes. By binding to the S1P1 receptor it is responsible for the circulation of lymphocytes between the blood, lymph and lymph nodes. This has led to the introduction of a new pharmaceutical, fingolimod, for treating multiple sclerosis. In 2012, Michael A. Hanson et al. published the X-ray structure of S1P in a Science paper. The structural resolution was about 3 Å. 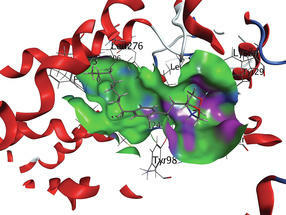 For our study we used the published structure 3V2W (Figure 3a, Pdb code - http://www.pdb.org/pdb/home/home.do) . S1P1 was fused with T4 lysozyme to obtain a stable protein structure for crystallization (Fig. 3). In order to achieve a structure suitable for our investigations, errors in the X-ray structure and the fusion protein had to be removed. A combined process of homology modeling – MD calculations “Induced Fit” docking was used (Induced Fit: both the protein and the ligand to be examined are structurally flexible). This procedure resulted from the relatively poor resolution of the X-ray structure. 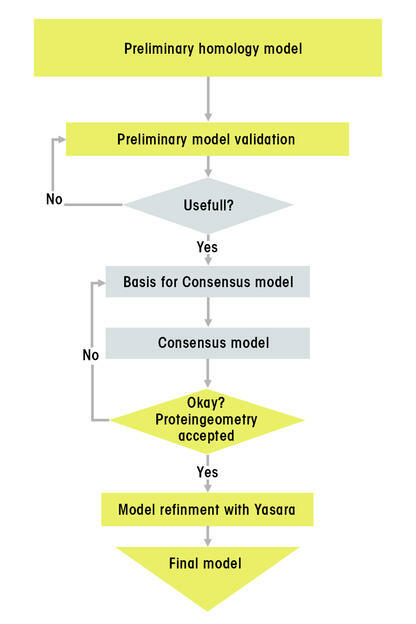 The homology model was then created according to the process steps we established (Fig. 4, flow chart). The model we developed could then be used to study new potential ligands to S1P1. 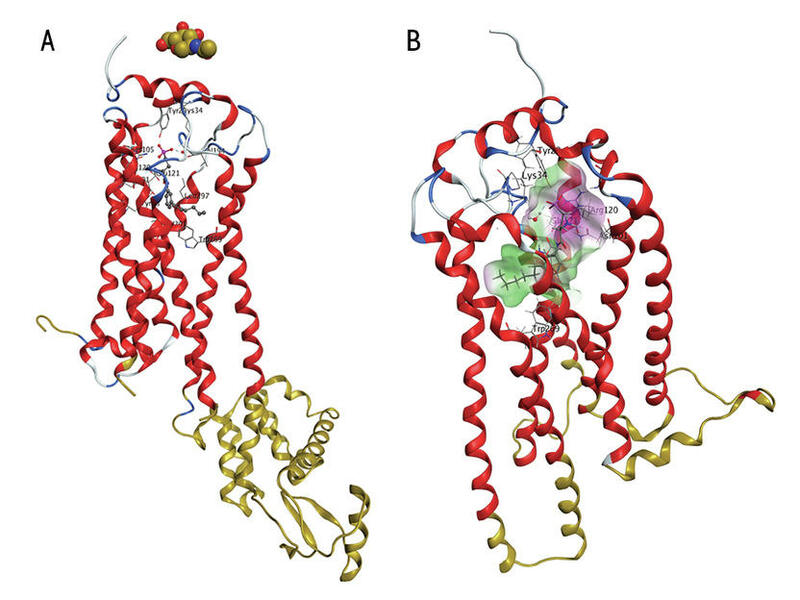 This receptor model showed that the new “butterfly compounds” (further developments of the immunomodulatory drug fingolimod – FTY720) are able to dock to the S1P1 receptor (Fig. 5) . The above examples show that new relationships between the uptake of various dietary ingredients, their metabolites and their interactions with proteins can easily be demonstrated by molecular modeling to characterize the effects on certain diseases and thus contribute to their prevention and finding their root causes. 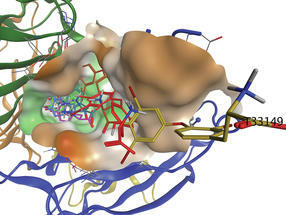 Header image: iStock | mammuth, xamtiw; molecular structure: Rawel, H.M. et al.